Cigarettes can be any dried leaf that people roll in thin paper to smoke, but the word is most often used to refer ones with dried tobacco leaves. The nicotine in the tobacco can be addictive to people. 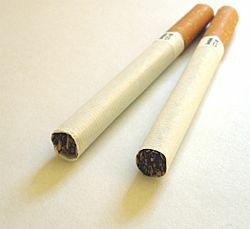 The nicotine from cigarettes makes people want to smoke more, even if they do not like the taste or its other effects. The smoke also has other things that are bad for people's health. Many countries have laws saying who can smoke tobacco cigarettes and where they can smoke them. They can cause lung cancer, heart disease and many other diseases. Most packs of cigarettes have warning labels on them. Smokers have symptoms such as frequent coughing, chest pain, and breathlessness. Doctors say that people should not smoke, as it can harm almost every organ in the body. Cigarette smoke contains many harmful substances. Among them are nicotine, tar, carcinogens and carbon monoxide. Nicotine is a drug that is addictive. It damages brain tissue. Tar is a sticky substance that kills cells and causes lung cancer. Carcinogens are substances that cause cancer. Cigarette Facts for Kids. Kiddle Encyclopedia.